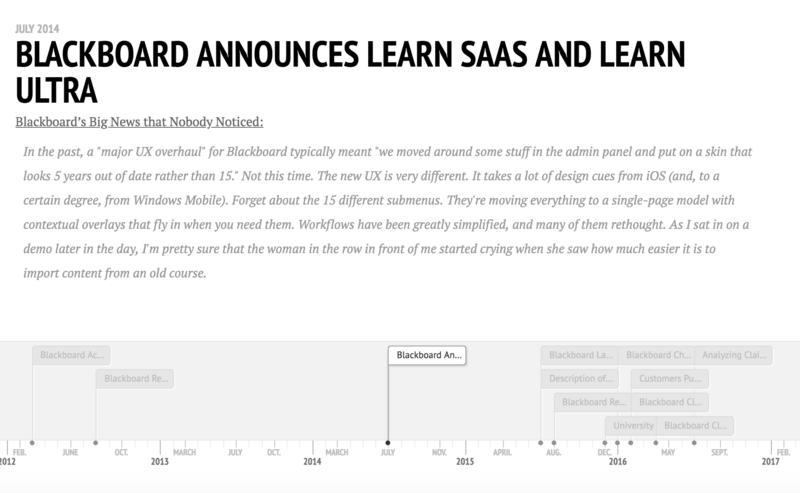 While doing research for an upcoming analysis post on Blackboard Learn, I found myself wanting to have a coherent timeline of past e-Literate coverage on the development and adoption of Learn Ultra. The most useful timeline tool seems to be TimelineJS by Knight Lab out of Northwestern University, so I gave it a try. The result of combining article data with this tool is an interactive timeline that allows the reader to browse relevant posts since 2012, showing the date of publication, a linked post title, and a snippet of content. You can click on the timeline navigation at the bottom, or you can browse through the overall story by using the arrows by text or swiping left / right on mobile devices. It might be easier to view this as a full page timeline instead of the embed within this post. Going through this exercise, I was a little surprised to see the two-year gap in coverage between July 2016 and July 2018. Let us know if this timeline view is useful. We may create other versions to help navigate topics like the OPM market. I am glad we are out of that mess. We just switched to Canvas and are loving it!